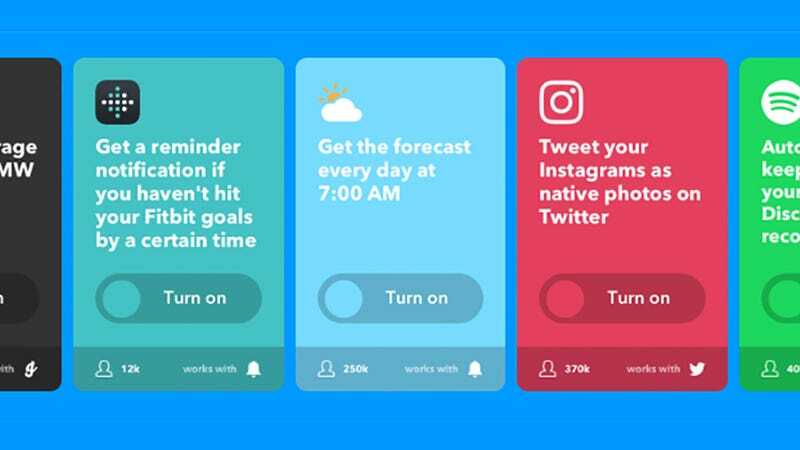 Earlier this month, IFTTT (If This Then That) changed its automation platform into a more sophisticated tool. Rather than using one-dimensional “recipes” that trigger actions when certain conditions are met, the company launched something entirely new called “applets.” The new applets allow users to create multiple actions from a single condition and filter conditions. In short, it makes it easier to create complicated conditional statements. We’ve written about IFTTT before on Field Guide, so it seemed like a no-brainer that we’d revisit the service after this major update. With that in mind, here are 15 new applets you can start using now for free. A lot of IFTTT’s most fun automation tricks revolve around the Space channel, fed with a variety of official data, and here’s a simple one you can set up to get started. If you select Astronomy picture of the day by NASA as the trigger from the Space channel, then choose Android Device and Update device wallpaper as the action, then you’ve got yourself an automated wallpaper changer, with a rotating carousel of images that are guaranteed to be worth checking out. IFTTT often works best when it’s taking care of the basic actions that you might forget, like muting your Android device at a certain time. Pick Date & Time then Every day of the week at as the “if this” option, enter your bedtime (you can leave it blank at the weekend if you like), then choose Android Device and Mute ringtone as the “then that” setting. Is your personal social media branding as consistent as it should be? To save you the trouble of setting your Facebook and Twitter avatars separately, you can have IFTTT instantly update one after you change the other. Pick Facebook and Your profile changes as the trigger in your applet and then Twitter and Update profile picture as the action. If you don’t want to dip your toes into the Facebook waters to see the pictures your friends are uploading of you, collect them on your phone. You are tagged in a photo is the trigger (under Facebook) and then you can use Add photo to album (under iOS Photos) as the action. Note that some pictures might be blocked depending on their privacy settings. Instagram has some pretty handy geolocation features of its own but you can expand on them with an IFTTT applet. For example, pick Instagram and New photo by you in an area as the trigger and then either the Dropbox or Google Drive upload options as the action to automatically upload all the pictures you take in a specific area to the cloud. IFTTT comes with a bunch of music-related applets as well. If you’re in the habit of favoriting tracks as you listen to them on YouTube then you can use its New liked video trigger and the Add track to a playlist action in the Spotify channel to send tunes from one service to another (assuming the liked YouTube videos are all accurately titled). About to run out of smartphone juice? Create an applet where Battery drops below 15% (under Android Battery) is the “if this” and Send an SMS (under Android SMS) as the “then that” just to make sure your significant other doesn’t panic when you don’t respond. At the moment there’s no equivalent trigger for iOS, so this one’s for Androids only. If you’re one of those people who favorite tweets to remember to come back to them later, you can send these Twitter links directly to your read-it-later service of choice. Select Twitter then New liked tweet by you as the trigger in your applet, then Instapaper, Pocket or iOS Reading List (plus the relevant save option) as the resulting action. Sometimes text messages have important information in them, like addresses or numbers, that it’s useful to be able to search through later. By choosing the Any new SMS received or Any new SMS sent triggers from the Android SMS channel you can build up a spreadsheet of them in Google Drive, or save them to your email, or add them to Evernote. One of the Twitter tricks IFTTT is capable of involves tweets and geolocation. Start your applet by selecting Twitter then New tweet by anyone in area, then set the area as your neighborhood (or anywhere you like). Next, choose Twitter and Add user to list and you’ve got a list of all the nearby tweeters. Alternatively, create a list in Google Docs. No time to check the web? IFTTT has a Feed trigger, which means you can enter the RSS feeds of your favorite sites and send them to all kinds of other apps and services. One option is to choose Email then Send me an email as the action, and each RSS item should appear as a correctly formatted HTML email that promptly drops into your inbox. The comprehensive Weather channel on IFTTT (covering everything from sunrise to pollen count) is useful in a variety of ways, and one of those is to use it with the Day One journaling app, and send weather reports straight to your diary. You can also post weather reports on Google Calendar or your Twitter feed, depending on how you want to use them. This one is pretty fun: pick Gmail and New email in inbox from as your “if this”, then Philips Hue and Blink lights as your “then that”, and you’ve got a smart system that flashes the lights when the boss or anyone else important emails. You can adapt the applet to change the color of the lights in your home office based on email senders. One of the action choices you get on IFTTT, under the Phone Call channel, is to have the service ring your phone, and there’s even the option to have a preset script read out if necessary. If you need to make a sharp exit from somewhere, for example, set this applet to launch when you send a specific text from your device, or at a certain preset time. OK, fine. This one isn’t going to make you anymore productive, but it is still pretty cool. For the “if this” part of the applet, choose Space and then Astronaut enters space. For the “then that” action, you can have alerts sent via SMS, email, Pushbullet or any other messaging app.